The Reasons Master File is used to track why a Customer Return, Invoice Adjustment, Manual Credit Card, or Inventory Adjustment was performed. The User will be prompted to select a valid Reason in order to complete the transaction. To access Reasons from the menu bar of the main TeleTracker Online screen, click on Master Files, then Reasons. To create a new Reason, click on New button located on the toolbar. 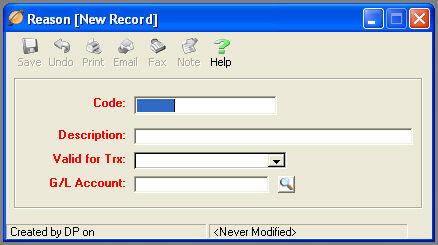 To open an existing Reason, select the Reason from the Reasons Master File list and click the Open button. Description : This field is used to further describe your Lead Sources code. Valid for Trx : This field identifies for which transaction this Reason is valid. Each Reason is limited to being used by one type of transaction. Select the appropriate transaction type from the drop down menu. G/L Account : This field is required if you are Synchronizing with QuickBooks. If you are NOT synchronizing with QuickBooks populate this field with the provided default account: 9999-TELETRACKER SUSPENSE GL CODE. Please visit the QuickBooks help file for further information regarding your General Ledger Accounts and synchronizing with QuickBooks.